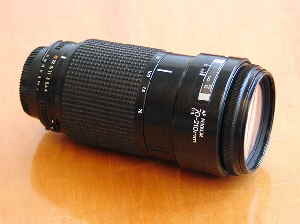 The Nikon AF 70-210mm f4 is an older style heavyweight Nikon metal and glass lens. Unlike many older Nikon AF zooms this is a two ring design and handling is good. This lens is quite rare but you still see them regularly on ebay. It is very well made and the zoom action is smooth. The lens is unusual in that, although it is a Nikon lens, there are stories of some models not focusing correctly on newer Nikon bodies - in particular the F80 and related digital bodies from Nikon and Fuji. My one works fine on the D70 and Fuji S2 Pro. Focussing is slow by modern AF-S standards but reasonably quiet and precise. Optically this is a very good performer even at maximum aperture which is a constant f4 throughout the range. The lens does vignette noticeably at maximum aperture and there are small amounts of colour fringing on contrasty edges but in general sharpness is very good, although not in the same league as Nikon’s 80-200mm f2.8. As a cheap alternative to the Nikon AF 80-200 f2.8 this is a good buy, but try to check for compatibility with your camera body before you buy. In particular check it focuses accurately.